Graduate lathe, a great machine for bowls, though not without faults. The Graduate lathe was designed in consultation with Frank Pain, one of the first turners to write for the amateur. He was a professional of very long experience and knew a thing or two about lathes and woodturning. I bought my Graduate lathe many years ago. At the time it had little competition. It was perhaps the most solidly built machine available for non-industrial use, and the lathe you bought if you wanted the best. It was intended primarily for use in schools, back when schools taught woodwork, although my own first turning experience at school was on a Myford. Ray Key, another well known turner, described the Graduate as being ‘head and shoulders above the rest’. This lathe comes in a long bed and a short bed format. Mine is a short bed, better for bowls and boxes because it takes a larger diameter and you can stand in front of the work without bending. It can be used for spindle turning, though not very convenient for this, and the maximum workpiece length is short. I have now bought a larger machine, but happily used this lathe for bowls and any larger work. It was a great improvement over the small spindle lathe that I owned at the time. One problem with the Graduate lathe is that its centre height is low. Most people would want to raise the height. I had a welded triangular platform standing on steel pillars made for mine. This brought the centres up to elbow height, which is the normal standard. It also increased the footprint a little, making it more stable. I have not found it necessary to bolt the machine to the floor. It came with a 3/4 horsepower motor and 4 pulley speeds with a range from 425 to 2250 rpm. This was not suitable for the large discs that I later began making for globe stands, which needed more power and a lower speed. I therefore upgraded with a bigger motor and a Variturn variable speed drive and had a special large steel faceplate made for these jobs. This goes on the left hand end of the spindle and allowed me to turn discs of over a metre in diameter. I installed the Variturn kit myself. It’s a great addition, quiet and smooth, but the lathe still lacks power for very large work. It copes with large bowls, but I prefer a 2 or 3 HP motor to let me work faster. Although the Graduate lathe was a great machine in its day, and performed very well for most of my work, it has some weaknesses. The shortbed version seems to have been a design afterthought. For all its good points, its design leads to some problems. The strange tailstock causes some problems. It is not used on the long bed machine. I didn’t often use the tailstock, so the problems I describe below rarely caused much inconvenience in practice. The curve of the tailstock casting increases the distance between the centres. It is partly hollow, being open at the back. This causes lack of rigidity, and you can sometimes see it flexing as the work turns. The tailstock position sometimes falls where the two bed slots join at right angles to each other. In this position it is not properly supported. Both the foot of the casting and the locking plate below the bed are too small to bridge the slots at this point – an obvious flaw. You can see this in the photo below. I used an extra-large washer below the bed to help bridge the gap. Graduate shortbed lathe showing unusual tailstock and crossed slots in bed. The curved casting has its foot closer to the headstock casting than its centre point. This means that when you want the point close to the headstock the locking lever below the bed will not turn. The headstock casting obstructs it. This means that you can’t always give a shallow bowl blank on a faceplate tailstock support. You can’t pin a disc against a faceplate with the tailstock. The tailstock ram is just a screw (hollow, to take a No. 2 Morse taper) with a cross hole for a tommy bar to advance and retract. I made a winding handle to use instead of a tommy bar. The alignment of the screw on my lathe is not good. The upper part of the tailstock twists in the casting. A pin locks it, and there is enough play to throw the centre slightly out of true. The toolrest holder casting is also curved and hollow, as shown in the photo. You can mount it in either of the two slots in the bed, with the same problem at the point where the slots meet. I find however that it is normally set in the cross slot clear of the junction. When the tailstock is in place, the feet of the two castings and their locking levers below the bed can sometimes get in each other’s way. The tool rest holder also lacks rigidity to some extent. The foot of the casting is not directly under the tool rest stem, which allows slight flexing. The holder can slide along the bed slots and swivel, which ought to give free movement of the rest. But as it swivels, there are times when you cannot put the rest in the right position. and the toolrest locking handle, which is another tommy bar, can foul a large workpiece. With the tailstock removed, which is how I usually have it, the toolrest holder has more freedom of movement and there is rarely a problem in practice. The rests themselves are excellent for faceplate work – rigid, and with a good slope and narrow top. They are not so good for spindle work if you like an underhand grip with a finger behind the rest. The headstock consists of a single iron casting from floor level up. The shell is heavy and robust, with a thin wall. Bolts attach the cantilevered beds to it. 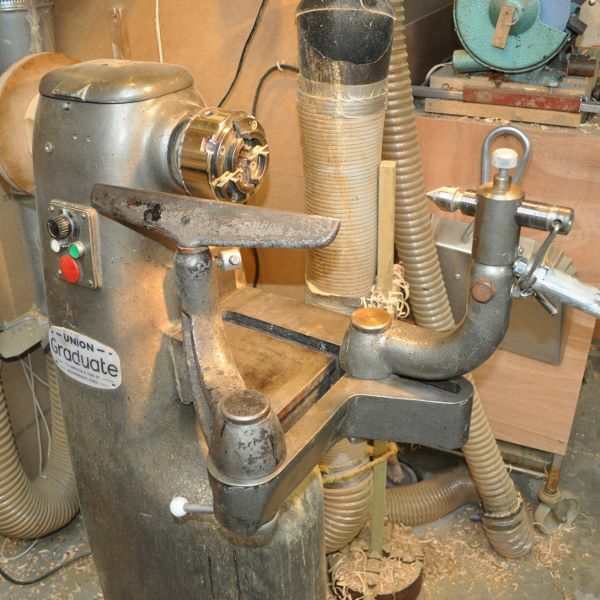 The lathe came with an outboard bowl turning bed on the left of the headstock. But the inner and outer beds are the same height, so there is no more capacity when using the left hand bed on the short bed model. You cannot use the tailstock outboard. The spindle rotation originally was fixed (now reversible with the Variturn), so the threads are different and accessories aren’t interchangeable. Turning on the outboard side is in the reverse direction to the normal anticlockwise. Left-handed turners might like this. It can make some cuts easier, for example when hollowing bowls. The outboard spindle thread is the opposite hand to the inner side. Because of this, if you reverse the rotation, the chuck is likely to unscrew. But the outboard bed is at least a convenient handle when moving the lathe. It would be useful for large diameter work when attached to the long bed lathe. With the inboard bed removed, you can turn large pieces inboard. The limiting factor is when the headstock casting gets in the way. It bulges out half way down to accommodate the motor. Without the bed, a free-standing toolrest is essential. With the left hand bed removed, you can turn even larger pieces outboard. I have used my Graduate lathe to turn built-up oak discs of 60 x 1100 mm. The lack of power was a problem though. Both beds come off easily by removing the fixing bolts. There are dowels to align the beds accurately when replacing them. One person can do this with the help of a temporary wooden prop to help support the weight during this process. Some people set up a disc sander on the outboard side. The bed is then useful to carry the sanding table. No lathe is perfect. The Graduate lathe in its short bed version is in some ways a poorly designed and under-powered machine. But because of its mostly great build quality the lathe performs very well and can do excellent work. Any of these bowls could have been made on the Graduate. You may sometimes come up against its eccentricities. But it is usually a delight to use and a Graduate lathe is still a good buy. It’s far superior to most of the cheap lathes on sale now. I used mine for many years and was always able to find a way to overcome its limitations. I have never used the long bed version, which has a more traditional toolrest support and tailstock. It should be excellent for spindle work, though limited for bowl turning. CBN (cubic boron nitride) grinding wheels have advantages for grinding woodturning tools. They are the latest must-have kit. Unlike conventional wheels, they don’t require dressing to clean and true them, so make less dust, and they don’t wear down to a smaller diameter. They are said to be very long-lasting. This means that any jigs used with them never need adjusting after initial set-up. They have a thin layer of grit on a heavy steel or aluminium wheel. They are available with very fine grit and produce an excellent sharp edge on the tools. They are suitable for high speed steel and hardened carbon steel, but unhardened steel may clog them. I recently invested in a 180 grit 200 x 40 mm CBN wheel from Optigrind and installed it on my VEM grinder, which though old is a reasonably good quality machine. Some small burrs from the old wheel bushes made them too tight for the new wheel. Holding the steel bushes in my woodturning chuck, I skimmed them very lightly with a graver. They would have gone in as they were, but perhaps never come out again! I was able to keep the wheel shroud in place. People say that CBN wheels are inherently safe. They say you don’t need to guard them because, being metal, they cannot burst. But this ignores the possibility of entanglement in the spinning wheel. It could catch long hair or loose clothing. Of course, those are dangerous around the lathe too. An unenclosed wheel seems likely to disperse grinding dust more widely, and because they take a long time to stop, they may come into contact with something while still spinning. So it’s best to keep them enclosed if possible. The wheel runs fairly true, but not as true as I hoped. There is some vibration. I don’t know if the problem is in the wheel or my grinder. The abrasive layer is very thin, so you can’t true it up with a diamond dressing tool. I found also that the grinding surface has some visible ridges and grooves. Not enough to significantly affect the grinding, but a little disappointing. In use, the new wheel is fierce. I understand this is normal, and am expecting it to settle down as the grit begins to wear, but when sharpening a gouge I could see it shrinking before my eyes. It quickly re-ground a heavy scraper. The tools were sharp after this, but I can’t say they were sharper than the old ruby wheel achieved. Some people recommend a coarser 80 grit wheel, but I think that would be too aggressive for sharpening. I would rather take it slower when reshaping a tool and have a more gentle and controllable grind when sharpening. The wheel creates fewer sparks than the old wheel, which might make it a little harder to judge when the grinding is complete. But as the jigs are accurate, a single pass over the wheel is normally enough. The CBN wheel is wider than the old one. This makes grinding easier as there is less tendency for careless use to allow a gouge held in a grinding jig to fall off the side. But it does make the wheel heavier, so slower to wind up to speed and slower to stop. In one way, this is helpful as I can sharpen small tools as the grinder is slowing down. It’s then the equivalent of a slow-speed machine (my grinder runs at high speed). It’s nice not to have to dress the wheel to keep it clean. I hope that when the wheel is ‘run in’ and becomes less aggressive, it will be easier to use. UPDATE: The wheel has indeed become less aggressive and now I wish it worked quicker. But for sharpening, it’s fine. I still don’t notice that it gives a better edge than the stone wheel. I have a blue wheel on the other end of the machine and use that for gouges. I do think a CBN wheel needs to go on a good quality grinder, because it’s hard to eliminate any runout there may be. I am always looking for something new, and recently bought a pair of Alan Lacer skews, the large and the small, and have been trying them out. This is a review of the tools. I taught myself to use a skew chisel very early in my turning career and have worked with various styles of chisel, wide and narrow, thick and thin, carbon steel and high speed steel, manufactured and homemade, curved and straight edged. All have worked well, but though my favourite has changed from time to time, the one I keep picking up for smaller spindles, and also for scraping details of faceplate work, is converted from a beading and parting tool, with a square section of about 10 mm. Sometimes I have favoured a Richard Raffan-style curved edge, other times a straight edge, which is easier to hone. In the beginning I would cut beads by planing with the edge of the chisel. Later I changed to using the short point, and finally, on softer wood, to the long point. I think you can get used to any tool with practice. The key requirements of a skew chisel are reasonable rigidity, well-ground bevels and a sharp edge and points. My first impression of the Lacer skews was that a bit more blade and a bit less handle would have been nice. But the steel is generously thick and heavy, which is important for larger spindles, helping to avoid blade flutter and vibration. This is why I like my square section chisel. The Lacer bevels are long, which I like, and that makes honing easier. The cutting edges were not ready to use as supplied, but a little honing soon sharpened them up. The handles supplied are very substantial, too fat for my hands, though of course yours may be different. I removed the handles and turned them a bit thinner. In any case, it is only laziness that made me buy the tools with handles, I could have made my own. The tools have one long side rounded nicely and the other left square. The arrises on the square side are rounded over a little with the intention to help them slide on the tool rest. This is very important, and if your chisels don’t slide freely, soften the arrises yourself before trying to use them again. The Lacer chisel arrises were not very well rounded and did not slide properly. A few minutes with a coarse and a fine diamond hone improved things. Wax on the tool rest helps too. I wish lathe makers could find a durable low friction material for toolrests. The Lacer cutting edge has a very pronounced curve in the middle, almost a hump really. The edge at the long point starts at 90 degrees to the blade. By the time it gets to the short point it is nearly parallel to the side of the blade. The long point and the adjacent cutting edge have no skew angle at all. The short point is very obtuse, and the cutting edge close to it acts more like a knife than a chisel. The ‘hump’ in the middle projects a lot, though of course it is just part of the curve, not separate. With the chisel flat on the rest and the handle down, the hump can be used very effectively to rough down a spindle from the square. I’ve never been a great fan of skew chisel roughing though, as the tool must be kept very sharp for its other functions and roughing can put a lot of wear on the edge. For me, the shape of the edge is going to take some getting used to. Before buying, I half intended to re-grind the tools to a more traditional shape. I wanted a couple of heavy-section wide bladed tools and thought that these would do even if they had to be reshaped. But they suit Mr Lacer, so I shall give them a fair trial before changing them. I am finding that the short point is too obtuse for cutting on the point, making for poor visibility. This limits the tool somewhat. The short end of the curved edge is OK for planing a cylinder or rounding over a bead, but I’m not yet convinced that it’s better than the traditional. A ‘knife’-like edge does help avoid dig-ins though. The non-skewed part of the edge can be used like a straight chisel, which works nicely for simple planing of cylinders or tapers. Long point down helps prevent digging in. The long point cuts nicely round a curve. The weight of the tool helps stabilize it, though it will take a bit of time before I get used to the weight. Some might find it too heavy, and the tool might be a bit too big for use on a smaller lathe. The thickness of the blade also means that the bevel is very long and this means more time at the grinder. Visibility using the long point is good. It leaves a nice polished surface as you would expect. But the lack of any skewing at the point means the blade needs to be twisted away from the wood when squaring off end grain. Normally with a skew chisel, if it is held upright on its long edge, the skew angle automatically gives clearance to stop the edge touching the end grain. So I conclude that these are excellent tools, heavy and workmanlike, needing a little tuning up (but that could apply to others on the market too). The Alan Lacer grind is not essential to the use of a skew chisel. Other well-known turners have their own preferred signature tools. Any heavy-section blade can be ground to the Lacer profile, and that profile can be changed if necessary. Here is another post about Alan Lacer skews.